The Master Craftsman and Master Pillar Awards are extensions of the very successful Master Builders program. The Master Pillar award is the highest achievement recognition possible. 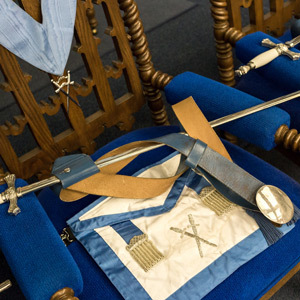 In addition to the requirements of the Master Craftsman award, a Master Pillar recipient must serve his Lodge as an elected officer and confer all three Masonic Degrees. See the award form for complete details. The Pennsylvania Franklin Medal was created in 1979 to honor distinguished Master Masons for their outstanding service to the Craft in general and Pennsylvania in particular. It has been awarded sparingly since then, maintaining very high standards for its presentation, and including among its recipients some of the most renowned Freemasons of our time. It is worn with Masonic regalia on formal occasions. The medal bears the likeness of Brother Benjamin Franklin, Grand Master of the Provincial Grand Lodge of Pennsylvania in 1734 and in 1749. The work of sculptor Donald DeLue, this rendition appears on the front of the solid gold medal, which is suitably engraved for the recipient on the reverse side, and attached to a purple and gold neck ribbon. 3. That seventeen (17) such medals be struck initially and the Grand Secretary and Grand Treasurer shall make available from current operating funds the sum of Seven Thousand Dollars ($7,000.00) to meet the costs of same. Carl W. Stenberg, Jr., R.W.P.G.M. Edward H. Fowler, Jr., R.W.P.G.M. Robert L. Dluge, Jr., R.W.P.G.M. Marvin A. Cunningham, Sr., R.W.P.G.M. Dr. Elvin G. Warfel, Professor Emeritus of Education and Human Services, Lehigh University, for devoted service to Masonic Education. Gerald D. Wagner, Methodist Minister and Grand Chaplain of the Grand Lodge for more than 25 years. Ronald A. Aungst, Sr., R.W.P.G.M. Kim W. Jeffreys, P.D.D.G.M., Member of the Committee on Masonic Homes, Pa. Masonic Youth Foundation Board of Directors and Aide to the Grand Master. The Grand Master’s Outstanding Service Medal is presented to honor Masons who have distinguished themselves through service to their community, Lodge or Grand Lodge. It was established by a Resolution of Grand Lodge, adopted at the Quarterly Communication held on December 5, 2007. That an adequate number of medals be struck initially and that the Grand Secretary and Grand Treasurer shall make available from current operating funds an appropriate sum to meet the costs of the same. The John Wanamaker Masonic Humanitarian Medal was created by resolution of the Grand Lodge of Pennsylvania at the December Quarterly Communication of 1993, under the leadership of then Grand Master Edward H. Fowler. It is to be awarded to a person (male or female) who, being a non-Mason, supports the ideals and philosophy of the Masonic Fraternity. 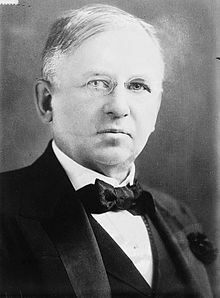 John Wanamaker was an outstanding public-spirited citizen and a lover of all people who devoted his life to doing good. The recipient of this medal is one who personifies these high ideals. The award is made at the discretion of the R. W. Grand Master. 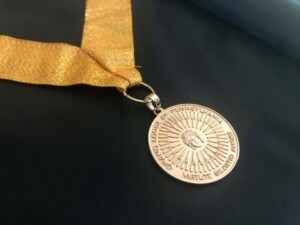 The medal has been presented sparingly to maintain the great prestige associated with an award created by resolution of the Grand Lodge, the others being the Franklin Medal for Distinguished Masonic Service and the Thomson Award for Saving a Human Life. Internationally known as a merchant, John Wanamaker was born in Philadelphia, Pennsylvania, in 1838. Little is known of his early life, but after a few years as secretary of the Philadelphia Young Men’s Christian Association, he and his new brother-in-law, Nathan Brown, opened a men’s clothing store called “Oak Hall” in 1861. In 1869, a year after Brown’s death, Wanamaker opened the more fashionable John Wanamaker & Company. He turned this store over to his brothers to manage, and in 1876, in time for the National Centennial, he opened the “Grand Depot,” a huge dry goods and men’s clothing store located in a former Pennsylvania Railroad depot. Unable to attract other merchants to open shop under his roof, in 1877 he opened a number of “specialty shops” that flourished after a year. He expanded into New York City in 1896 and continued enlarging his innovative “department” stores. He advertised effectively in newspapers and implemented a money-back customer guarantee. A devout Presbyterian, he founded the Bethany Sunday School (1858), and supported temperance and the Pennsylvania Blue Laws. An enthusiastic Republican, he was unsuccessful in his bid for various political offices. However, as a reward for his support of Benjamin Harrison, he was made Postmaster General of the United States in 1889 and created several improvements, including the introduction of the Parcel Post system. He was patriotic even to the detriment of his own business. He required military drill of his male clerks and offered to release them for service during the Spanish-American War and the First World War. But he truly cared about his labor force. To help his workers improve themselves, he provided business classes and benefits for his employees. Masonically, he was made a Mason-At-Sight with two other candidates, (John L. Kinsey and Rabbi Joseph Krauskopf) by virtue of the presence of Right Worshipful Grand Master William J. Kelly, in an Emergent Grand Lodge, held March 30, 1898, at the age of 62. Being a Mason-At-Sight meant that he did not belong to a Lodge, and many solicited for his affiliation. On January 9, 1900, he elected to become a member of Friendship Lodge No. 400 in Jenkintown, Pennsylvania, then a predominantly rural community. He was elected Senior Warden, and the following year served as Worshipful Master of this Lodge. Bro. Wanamaker belonged to no other fraternal society. He did become enthusiastically involved in many of the affiliated bodies of Freemasonry and received the Thirty-Third Degree in the Ancient Accepted Scottish Rite, but he always regarded the first three degrees of Freemasonry as not only fundamental, but essential in the understanding of Masonic beliefs and the reason for the existence of the Craft. He was appointed to serve the Grand Lodge as Chairman of the Library Committee by R.W. Grand Master James W. Brown, and was largely responsible for the phenomenal growth of the collection at the inception of the Library. Using his own personal wealth, he gathered together books, letters, and artwork which pertained to the history and moral teachings of Freemasonry. While serving in that position he donated a copy of William Joseph Williams’ portrait of George Washington in Masonic regalia, painted in 1794 at the request of Alexandria (Virginia) Lodge No. 22. By the end of his tenure as Chairman, the Library had over 17,000 volumes, and over 7,400 works of art and Masonic relics. He died on December 12, 1922. Awarded for: For her work in the area of study, treatment, prevention and education in the field of drug and alcohol abuse. Awarded for: For her charitable efforts and her efforts to make others aware of community needs . Awarded for: For her many years of devotion and service to the youth of Pennsylvania. Awarded for: For volunteer service to combat drug and alcohol abuse. Awarded for: For his commitment to education and teamwork, his elevation of the concept of the student-athlete, and his unique blend of character-building and leadership training for all team members. Awarded for:For her service to Masonic ideals through her unwavering support of Pennsylvania Rainbow in its time of need for leadership and stability during a period of great adversity. Awarded for: For his service to the public schools, and in particular his work with students with special needs, as well as his charitable activities. Awarded for: For her many years of service as an elementary school teacher in the city of Pittsburgh, and her uncommon devotion to serving the youth of Pennsylvania. Officially titled “The Grand Lodge of Pennsylvania Thomson Award for Saving A Human Life,” it is presented by the Right Worshipful Grand Master to a member of the fraternity who was primarily responsible for saving the life of a fellow human being. It bears a unique emblem which combines the square and compasses, the first aid cross, and the keystone, thematically portraying the themes of Brotherly Love, Relief and Truth. This emblem is joined with the seal of the Grand Lodge of Pennsylvania by a cabletow, the age-old symbol of the distance a Mason is to go in service to his fellow man. The Award is named for Brother John Thomson, a Past Master of Lodge No. 51, Philadelphia, who served as Right Worshipful Grand Master in 1861-1862. A common man with little schooling, he developed a respected trade as a cooper, learning the intricacies of barrel and tub construction from an apprenticeship with his father. Lack of formal education was no hindrance to him, for he became a very successful businessman and leader in Philadelphia. John Thomson’s long record of service to the Craft is unmatched by any other man in the history of the Grand Lodge. Born in 1799, he was proud of the fact that he was, for four months of his infancy, contemporary to that illustrious Brother and First President of our Nation, George Washington. He petitioned for membership on the twenty-second day of March 1827, and was entered into the Fraternity by the officers of Lodge No. 51 during the height of the Anti-Masonic period. Why was the award named for Thomson? Brother Thomson’s incomparable Masonic record of service might well have been enough to warrant the distinction of attaching his name to this award, but a singular incident in his life deserves particular notice: he was “publicly acclaimed” and cited by the Humane Society of Philadelphia for saving several persons from drowning in the Delaware River. We don’t know what this silver cup might have looked like. The cup he received is not presently in the archives of the Grand Lodge. It may be presumed to have been shaped like a two-handled loving cup, the form of the traditional trophy cup still used today when bestowing distinction and honor. The only other record of this award to him was reported as the presentation of a silver medal, rather than a cup, but this was in a printed Memorial Address, delivered by a Past Master in Lodge No. 51, on December 26, 1889, two months following his decease. We accept the son’s account as more accurate, owing to his intimate knowledge of the possessions of his father. It may be coincidence, or even, perhaps, providence, that the word for his occupation, cooper, is derived from the Latin root cupa, meaning, cup. In commemoration of Brother John Thomson’s unselfish acts of service, we present this silver cup to celebrate a response to the call of Masonic duty by hastening to the rescue, and saving a human life. A letter explaining the circumstances may be addressed to the Grand Lodge Officers (RWGM, RWDGM, RWSGW, RWJGW, RWGT and RWGS – all the positions in which Brother Thomson served) and sent through the District Deputy Grand Master, in accordance with Masonic Protocol, to the Grand Secretary’s Office. The recommendation will be referred to a review committee for investigation. Each nomination must be carefully investigated and documented. The committee will look for evidence that the incident involved the actual saving of a life from certain death, that the nominee was primarily responsible for saving a life, and that this was a case of SAVING a human life, rather than protecting it. Videotape, photographs, and written statements by multiple eyewitnesses, or reports filed by police, insurance or emergency personnel are the best evidence for these purposes. The incident must have occurred after December 8, 2000, when the Award was created by Resolution of the Grand Lodge. The nominee must have been acting outside the line of his duty as a professional or volunteer in the field of health, human services or safety. The committee is charged with granting the award only in cases of absolute certainty that the incident represents action worthy of the special recognition this prestigious award brings. The committee will ask for additional information if necessary, and will ultimately make a recommendation to the Grand Lodge Officers as to the merits of the nomination. Because of the singularity of this award, each selection will be held to the highest standard anticipated when the award was created. All inquiries and correspondence must go through the District Deputy Grand Master. The Thomson Award was designed by direction of Brother Robert L. Dluge, Jr., Right Worshipful Grand Master, 2000-2001. It was formally adopted by resolution in Grand Lodge on December 8, 2000. It is a sterling silver cup, handcrafted by Wendell August Forge of Grove City, Pennsylvania.